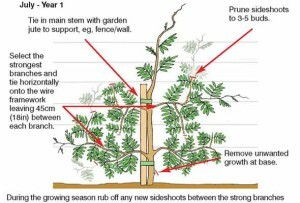 I found this really helpful and easy to understand on the whys and wherefores of growing Wisteria. I’ve bought a lot of plants from them over the years and have been very pleased with the quality. Wisteria is the quintessential climber for the English cottage garden. A well-grown wisteria is an absolute joy in May and June when the beautiful, scented pendants of flowers drape from the branches in a breathtaking display. But often gardeners find these climbing plants a little daunting. The idea of all that pruning and training just feels far too complicated. It’s a shame because it’s not as tricky as you might think – in fact wisteria is actually very easy to grow. With correct care these long-lived twining climbers will reward you with many years of pleasure in your garden. Take a look at our wisteria growing guide to learn how to care for your plant and how to prune wisteria. If you are planning to buy a wisteria plant then it’s worth checking that the plant is grafted as seed raised wisteria can take up to 20 years or more to flower. All of Thomson & Morgan’s Wisteria plants are supplied as grafted plants, so you should only need to wait a couple of years before you are rewarded with a fabulous display. 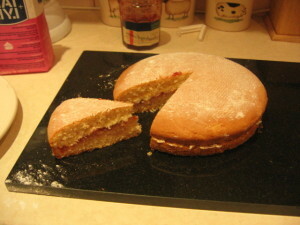 But if you fancy the challenge and have plenty of time on your hands then you can buy wisteria seeds from our website. There are lots of cultivars available but most are produced from two species – Wisteria sinensis (Chinese Wisteria) and Wisteria floribunda (Japanese wisteria). Here are the main differences between these different wisteria species. 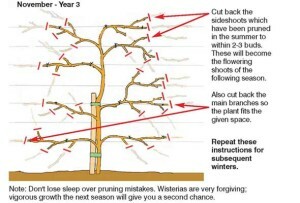 Location is in important factor to consider when growing Wisterias. They are long lived and will form woody stems over time which require significant support. This makes them very difficult to move if you change your mind in a few years time. Also bear in mind that they require regular pruning to keep them under control and to encourage flowering, so it’s well worth taking your time to choose the best possible location for your plant. Grow wisteria plants in a sunny or semi shaded site in any moist, well drained soil. Wisteria flower buds can be damaged by hard spring frosts so choose a sheltered position if possible. You will need to provide the twining stems with an appropriate and very sturdy support. The ideal way to grow Wisterias against a wall is to train them as an espalier, with horizontal support wires (3mm galvanised steel) set 45cm (18″) apart. Alternatively, you can train them onto a sturdy pergola, or even into a tree. Supports are best put in place before planting as it will be much harder to install them once the wisteria is in the ground. Prior to planting add plenty of well rotted manure or garden compost to the soil to improve soil fertility and drainage. Remember that your wisteria will be planted here for many years so it’s worth taking the time to create ideal soil conditions from the start. Plant wisteria at the same level that they were supplied in their pots. If you are planting a bare root wisteria then look for a soil mark towards the base of the stem which indicates what depth it was planted in the ground at the nursery. This is usually found a little below the graft point – a bulge in the stem where the main plant is grafted to the rootstock. Water your wisteria well after planting to settle the soil. During their first year wisterias will benefit from regular watering while the roots establish. Once established Wisteria should only need supplementary water during dry periods. A high potash feed can be applied in spring to help encourage flower production but don’t overdo it as over-feeding wisteria can cause more foliage and less flowers. This is one of the most frequently asked gardening questions and the elusive answer usually lies in one of the following explanations. 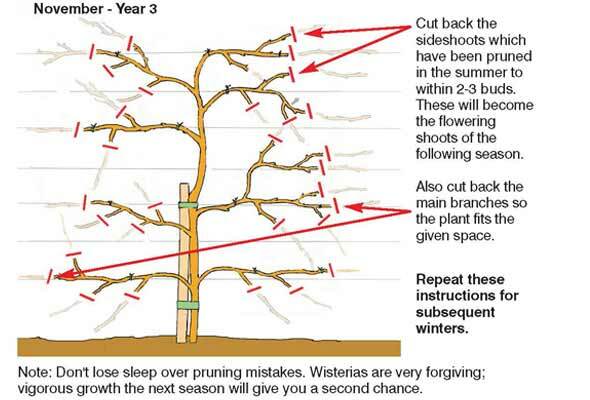 1) Pruning – Wisterias need pruning twice a year in July/ August and again in February. Check the diagrams above to make sure that you are using the right technique. 2) Seed raised plants – Wisteria grown from seed can take up to 20 years to flower. However it’s unusual to buy a seed raised plant nowadays as most are supplied as grafted plants. Nonetheless, it’s worth checking the base of your plant for signs of a graft in order to eliminate this as a possible cause of flower failure. 3) Watering – Wisteria often thrive on neglect, but they will appreciate some extra water between July and September. This is when the buds are formed for next year’s flowers. If they run short of water during these months this can reduce your display in the following summer. 4) Frost – Spring frosts can sometimes cause the developing buds to drop before they get a chance to open. The best way to avoid this is to plant your wisteria in a sheltered spot. 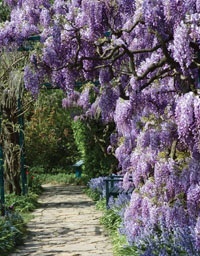 Just the thought of wisteria pruning can send many gardeners into a panic – but it needn’t be difficult if you understand a few basic principles. Unlike many plants, Wisteria needs to be pruned twice a year – once in late winter (February) to prepare the flowering spurs for the forthcoming season, and again in mid-summer (July to August). Summer pruning controls those long, whippy shoots that are heading off into the distance, and encourages them to become flowering spurs instead. 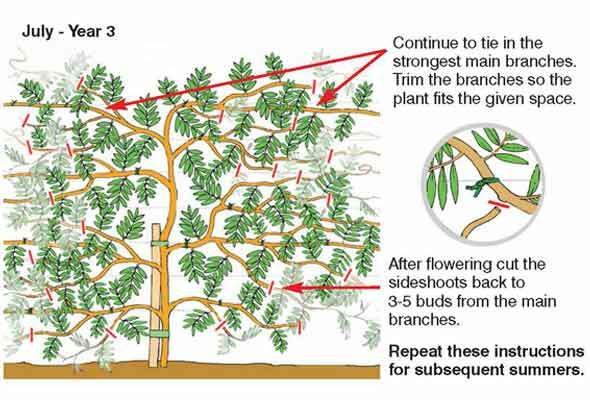 During the first two years, the aim of pruning is to train wisteria to create a framework of permanent stems. 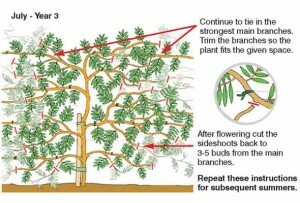 This involves selecting and tying in specific main shoots to the supporting wires and cutting back any unwanted growth. After 2 or 3 years the plants will build up a strong branching habit which forms the ‘skeleton’ of your wisteria. 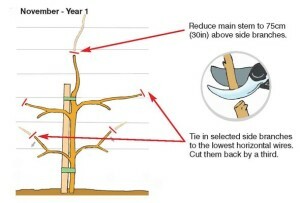 Once a framework of branches has been created, you can begin pruning with the aim of creating flowering spurs and containing the plant within its allotted space. Important note: Correct training and pruning of wisteria will definitely encourage better flowering, but it’s worth remembering that these plants are surprisingly forgiving, and vigorous growth the next season will give you a second chance if you get it wrong this year.